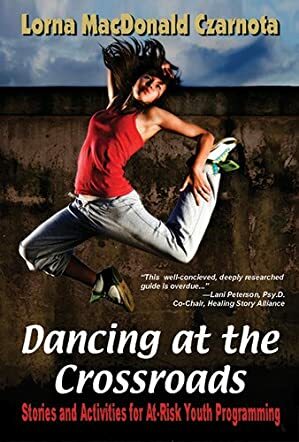 Dancing at the Crossroads by Lorna MacDonald Czarnota is a collection of adapted short stories intended for use as moral tales with what the author describes as ‘at-risk youth,’ although the text can also be put to other uses. The first portion of the book contains a collection of rewritten stories from various cultures around the world, as well as some original contemporary tales. The second portion of the book presents a variety of teaching activities that can accompany each story to inspire students to interact with the moral lesson. As an educator and teacher of English myself, I found the layout of the stories very helpful, particularly the brief overview of each tale at its start. This would be very useful when trying to find the right tale for the situation without having to remember each one in detail. The adaptations by Lorna MacDonald Czarnota of each story are simply written and would be easy for anyone of any age or educational level to understand, but they also lend themselves well to being read aloud. The development in the second part of the book was excellent as it offered insightful and imaginative ways to bring the stories to life within a classroom or therapy/group setting. I was a little disappointed, however, to find that some of the later stories did not have as extensive a collection of activities to go with them and did not contain discussion questions like the first ones. If this were to be rectified in a future edition, then Dancing at the Crossroads would be an even better handbook for educators and counsellors of troubled souls.